Enjoy Utah! : DATE NIGHT: Survivor! “Can You Survive the Dating World?" 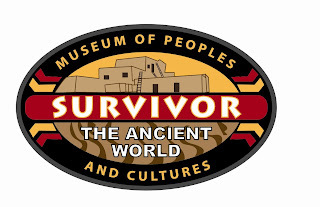 Friday night, September 17th, BYU’s Museum of Peoples and Cultures (MPC) will kick-off the new school year by hosting their “Survivor Date Night,” an event where couples can uncover their skills in trying to “Outwit, Outlast, and Out-date” the competition. The event starts at 7:00 p.m. The date night will begin with couples divided into tribes and then taking a tour of the MPC’s current exhibits: “New Lives: Building Community at Fourmile Ruin” and “Beneath Your Feet: Discovering the Archaeology of Utah Valley.” These tours will help the tribes prepare for the night’s challenges, which include a timed excavation in a sand pit, a relay race to rebuild a broken pot, and a trivia question round.